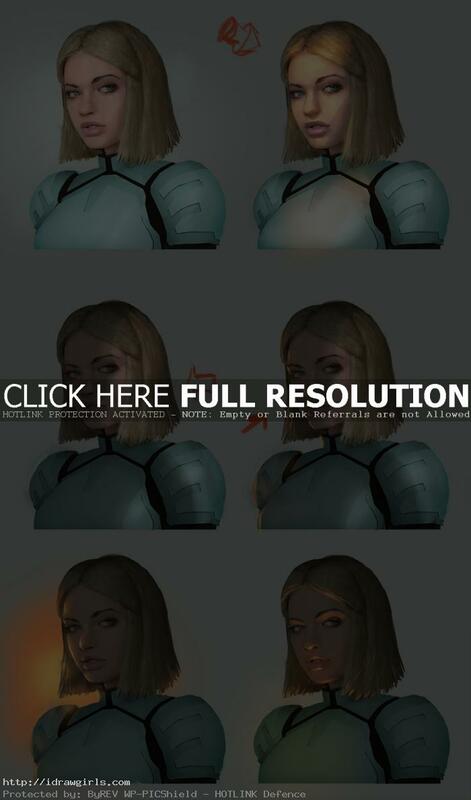 Painting face with different lighting directions tutorial. This video tutorial shows you how to paint different lighting direction for portraits. You can scroll down further to see step by step images with instruction. In this tutorial, you will see six different lighting direction and method. Painting face with different lighting directions tutorial. 1) Diffuse lighting on portrait. Diffuse reflection is the reflection of light from a surface such that an incident ray is reflected at many angles rather than at just one angle as in the case of specular reflection. 2) Direct lighting on portait. Lighting in which the greater part of the light goes directly from the source to the area lit. 3) Side lighting on portrait. Side lighting is light that falls on a subject at roughly ninety degrees to the camera. This means that one side of a subject will be lit and the other side will be in shadow. In terms of helping to convey a subject’s shape and form this is ideal. 4) Side lighting with rim-light on portrait. It is side lighting with strong bounce light from the shadow side. 5) Backlighting on portait. Backlighting is the process of illuminating the subject from the back. In other words, the lighting instrument and the viewer face each other, with the subject in between. This creates a glowing effect on the edges of the subject, while other areas are darker. 6) Under lighting on portrait. Light comes from below directly to the subject.